The global alcoholic beverages market has witnessed impressive growth over the last couple of years driven by a number of favorable factors. Growing urban population coupled with rising disposable incomes in emerging economies is leading individuals to explore new forms of entertainment such as night parties and spending time at bars, lounges. Further, young adults with high family incomes, high social media influence, and easy access to alcoholic drinks are other prominent factors driving sales of alcoholic drinks. In urban areas, high pressure jobs and the perception that consumption of alcohol is relaxing to the mind is leading to the increased consumption of alcoholic drinks. Manufacturers of alcoholic drinks that are continuously launching new products with added flavors. Curiosity among consumers especially among millennials is attracting them to try these products, which is having a positive bearing on the alcoholic beverages market. On the down side, excessive consumption of alcohol which is adversely affecting health, especially the health of young adults might challenge the growth of alcoholic beverages market. As per a report released by WHO in 2014, 3.3 million deaths each year across the world are related to excessive consumption of alcohol. 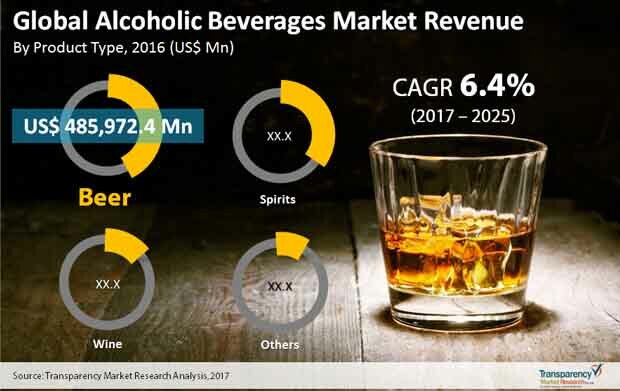 According to a report by Transparency Market Research, the global alcoholic beverages market is likely to expand at a CAGR of 6.4% vis-à-vis revenue between 2017 and 2025, for the market to become worth US$1,977, 342.7 mn by the end of 2025. The global alcoholic beverages market is estimated to be worth US$1,205,359.1 mn by the end of 2017. The report studies the global alcoholic beverages market based on product type, packaging type, sales channel, and geography. The key segments of the global alcoholic beverages market based on product type are beer, spirits, wine, and others. The beer segment, amongst all, is estimated to represent 42.7% of the overall market by 2017 end. Based on packaging type, the global alcoholic beverages market is segmented into glass bottles, plastic bottles, tins, and others. The key segments of the market depending upon sales channel are modern trade, specialty stores, convenience stores, commercial, hotels/restaurants/bars, online retailers, and other retailing formats. Of them, specialty stores segment is estimated to hold 27.4% of the market by the end of 2017. In this report, North America, Latin America, Europe, Asia Pacific, and the Middle East and Africa are the segments that divide the alcoholic beverages market based on geography. Of them, Asia Pacific is the prominent region accounting for the leading share in the overall market. This is mainly due to increasing urbanization and a growing middle-class population with disposable incomes. However, amongst all, Latin America is expected to display the leading 5.4% CAGR between 2017 and 2025. This is mainly because of rising urbanization and increasing per capita income in this region. Furthermore, changing lifestyles, influence of social media, and increasing trend of entertainment at clubs, lounges is driving sales of alcoholic beverages. Key players in the global alcoholic beverages market profiled in this report are Carlsberg A/S, Diageo Plc., Suntory Holdings Ltd., Brown-Forman Corporation, Craft Brew Alliance Inc., Anheuser-Busch InBev SA/NV, United Breweries Limited, Molson Coors Brewing Co., Accolade Wines Holdings Australia Pty Limited, The Wine Group LLC, Heineken Holding N.V., Asahi Group Holdings Ltd., Halewood International Holdings Plc, Bacardi Limited, Bundaberg Brewed Drinks Pty Ltd, Constellation Brands Inc., The Boston Beer Company Inc., Pernod Ricard SA, DGB Pty Ltd., and Bronco Wine Company. This report provides forecast and analysis of the global alcoholic beverages market. It provides historical data of 2015 along with estimated data of 2017, and forecast data up to 2025 in terms of revenue (US$ Mn). The report also includes macroeconomic indicators along with an outlook on alcoholic beverages for global market. It includes drivers and restraints of the global alcoholic beverages market and their impact on each region during the forecast period. The report also comprises the study of current issues with consumers and opportunities for alcoholic beverages products. It also includes value chain analysis. In order to provide users of this report with comprehensive view of the market, we have included detailed competitiveness analysis and market key players and strategy overview. The dashboard provides detailed comparison of alcoholic beverages manufacturers on parameters such as total revenue, product offerings, and key strategy. The study encompasses market attractiveness analysis by diaper type and region. The report includes alcoholic beverages market company profiles and the revenue generated from the companies across North America, Latin America, Europe, APAC and MEA. By Product Type, the global alcoholic beverages market can be segmented into beer, spirits, wine, and others. By sales channel, the global alcoholic beverages market is segmented into Modern Trade, Specialty Stores, Convenience Stores, Commercial, Hotels/Restaurants/Bars, Online Retailers, and Other Retailing Formats. By packaging type the market has been segmented as glass bottles, tins, plastic bottles and others. For the calculation of revenue collection of average regional prices were obtained through primary quotes from numerous alcoholic beverages manufacturers, retailers and distributors. All key end users have been considered and potential applications have been estimated on the basis of secondary sources and feedback from primary respondents. Country demand patterns have been considered while estimating the market for various end users of alcoholic beverages in the different regions. Top-down approach has been used to estimate the alcoholic beverages market by countries. Global market numbers by product type has been derived using the bottom-up approach, which is cumulative of each country’s demand. Company-level market share has been derived on the basis of alcoholic beverages penetration. The market has been forecast based on constant currency rates. The report provides detailed competitive and company profiles of key participants operating in the global market. Some of the major companies operating in the Global Alcoholic beverages market are Carlsberg A/S, Heineken Holding N.V., Diageo Plc., Asahi Group Holdings Ltd., Suntory Holdings Ltd., Halewood International Holdings PLC, Brown-Forman Corporation, Bacardi Limited, Craft Brew Alliance, Inc., Bundaberg Brewed Drinks Pty Ltd, Anheuser-Busch InBev SA/NV, Constellation Brands, Inc., United Breweries Limited, The Boston Beer Company, Inc., Molson Coors Brewing Co., Pernod Ricard SA, Accolade Wines Holdings Australia Pty Limited, DGB(Pty)Ltd, The Wine Group LLC and Bronco Wine Company.